Two weeks back I borrowed Vegan Italiano book by Donna Klein from the library in order to send a couple of entries to DK’s AWED – Italy and Dee’s Herb Mania – Basil. But due to some reason or the other I was not able to open the book until yesterday. The book has everything from appetizers, soups, salads, one pot meals to decadent desserts. I don’t know why, but I always start from the last in any book/magazine (not fiction though). Once I also heard an astrologer mention that “Mithuna” (Gemini) rasi people tend to do that. 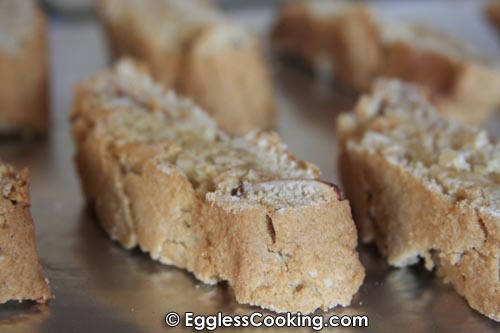 While doing so I found this simple almond biscotti recipe using applesauce. The amount of fat/oil used in the recipe also caught my attention. It requires just 1.5 tablespoons of canola oil! 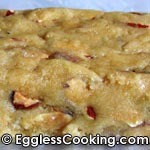 A very simple recipe to bake eggless almond biscottis using whole wheat flour and applesauce. Preheat the oven to 350F (175C) for 15 minutes. Line a standard size baking sheet with foil or parchment and set aside. 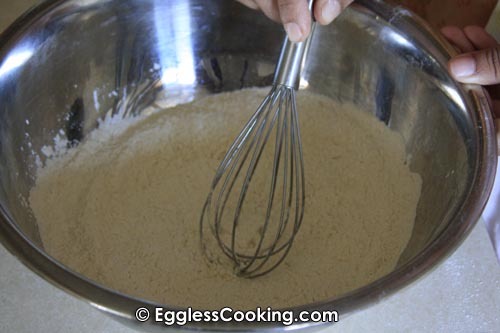 In a large bowl, mix together the flours, baking powder, and salt until thoroughly combined. 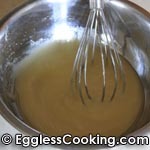 In a medium bowl whisk together the sugar, applesauce, oil and extracts. 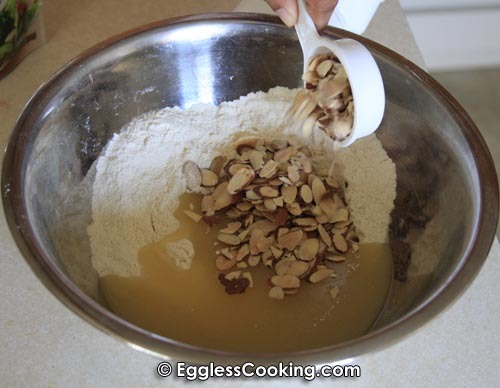 Add the sugar mixture and almonds to the flour mixture, stirring to combine. Finish mixing with your hands until thoroughly combined. Bake on the center rack 25 minutes or until firm to the touch. Remove the baking sheet from the oven and let cool 15 minutes. Decrease the oven temperature to 300F(150C). Using a sharp knife carefully cut the cooled log crosswise into 1/2 inch wide slices. Remove the foil and place the slices, cut-side down, on the baking sheet. Bake about 7 to 10 minutes, or until bottoms are just golden. Turn the slices over and bake to 5 to 8 minutes, or until bottoms are golden. Using a spatula, transfer to a wire rack and let cool completely. Store in airtight containers up to two weeks, or freeze. Shaping the dough into a log: At first I floured the surface and tried making log, but transferring it to the baking sheet was a little tricky. Instead I rolled back the dough into a ball again and transferred it to the baking sheet and formed a log on the sheet itself. This was very easy. Also slicing the baked log, requires patience, because it tends to break in the middle. I observed that the baking time mentioned in the recipe (both for baking the log and for baking the slices) are just approximations. It took another 5-8 minutes to get the desired result. The biscottis came out well, but I would suggest using all purpose flour itself instead of whole wheat flour and also reducing the quantity of sugar to 1/2 cup. It was very sweet to our taste, also it had an earthy flavor because of the whole wheat flour. 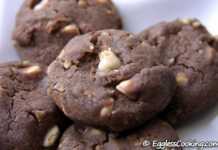 I have made chocolate cookies using whole wheat flour earlier and my family loved it, but we felt that it did not work out for the biscottis. 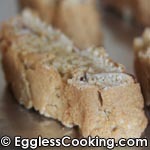 This eggless biscotti recipe is definitely a keeper and I will be baking it regularly using all purpose flour. Next RecipeI Can’t Believe It’s Eggless Chocolate Cake! What can I replace applesauce with? Usually I can come up with substitutions pretty quickly but going blank for this one! 😉 I’m thinking just about any liquid should be fine, including dairy/non-dairy milk. These were amazing!!! I used whole wheat flour and coconut oil instead of canola and added cranberries and no applesauce but they came out soooo delicious!!! Thanks Eve. Almonds and cranberries combination sounds great. I baked fruit cake version of these (adjusted quantities for sugar and apple sauce). And they came out soooo good! Thank you so much for this recipe.You taught me to use apple sauce in my baking and I use it all the time now! thanks! Sure and thanks for trying the recipe. 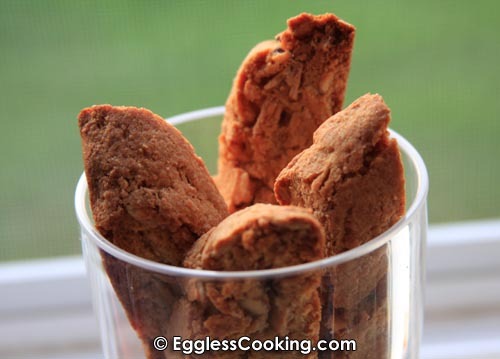 Hi Madhuram,thanks for all ur efforts to share all the wonderful recipes.i tried this biscotti but mine was very hard.I don’t know where I was wrong , can u please suggests . How many minutes did you bake it? 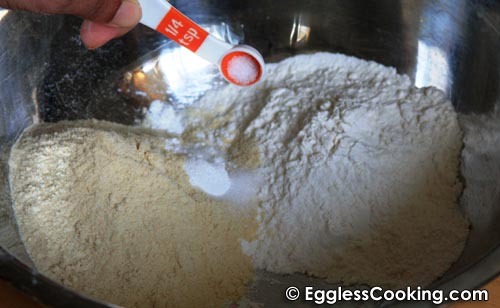 Did you use all purpose flour or whole wheat flour? Thanks so much for the eggless recipe! I love biscottis and was very excited to try it out. I made the biscotti based on your recipe. First of, the initial dough came was quite loose. I wasn’t sure what the consistency should be and I don’t know how the dough turned out so loose even though I thought I followed the directions, maybe I added too much applesauce? Anyways, I added some more all purpose flour and got it to a cookie dough consistency. Baked it twice and I have the biscotti ready! The biscotti is not very sweet, maybe I should have added some more sugar when I added more flour? This recipe is for keeps and I want to bake a set for my son’s school’s bake sale. 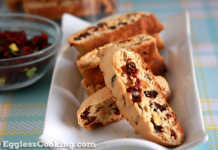 Can you please let me where I may have gone wrong so that I can make better quality biscotti next time! Thanks much for all your recipes! I’ll try some of your eggless cakes next! You’re welcome Madhu. I went and read the recipe again and see that it’s pretty straight forward. 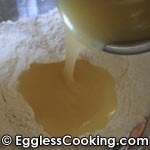 I don’t see any reason why the dough would have been loose unless and otherwise you either added extra applesauce or canola oil by mistake. The pictures we have in the procedure can be magnified. 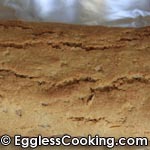 Did you click the log of dough picture to see to get an idea about the consistency of the dough? 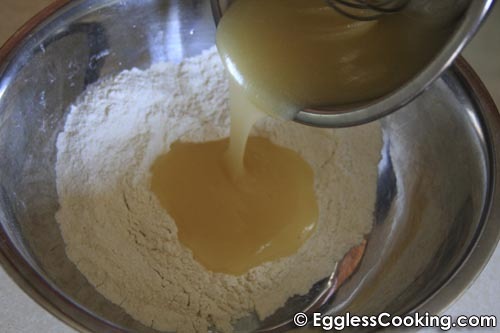 If you added a considerable amount of flour than you should balance it with some more sugar. Thanks Diane. I haven’t tried substituting honey for sugar, so I wouldn’t know if it would work. I baked the biscotti last night. They taste yum but they are chewy and the color is no where close to yours..My final product has the color of your baked dough. First of all making the log was very tedious , it was too sticky. is it supposed to be like that? I baked the dough log for 32 mins until it was firm to touch. But my baked dough was lil light than what I can see in the pic here. After cooling it for 15 mins I cut the log into pieces. Unlike you mentioned Cutting the log was not tricky at all. So does that mean I should have baked it for some more time? Yojana, its difficult for me to bring back to memory how the biscottis tasted or looked because it is almost 2 years since I baked it and did not bake it again. Don’t bother about the color because sometimes we do enhance the picture to make it look good. If you see the last picture in the procedure section you can see that it is not as reddish as the main picture. I’m assuming that the biscottis did not bake enough, it can be the oven too. Hope you preheated the oven. Anyway try putting back it in the oven at 325F for another 5-8 minutes or until you get some color. Maybe try with 2 or 3 first and seeing how it fairs increase or decrease the time accordingly. Will let you know the results as soon as I bake them tonight. Hey Madhu , nice recipe.. Can’t wait to try this one… I have two questions..
1. 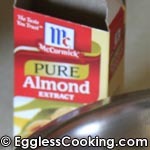 I dont have almond extract but have almond butter, do you think I can use that instead of the extract and in what quantity, please suggest and also suggest what other changes I need to make. 2. 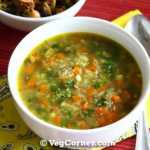 I am going to visit India in May and would love to make this for my family there, but in India we use groundnut or soyabean oil.. Is it ok to use in this recipe as I am not sure if we get canola oil in India..
Yojana, almond butter cannot be used instead of almond extract. Just use plain vanilla extract if you don’t have almond extract or get one small bottle and it comes for such a long time. Even a small drop gives an excellent almond flavor. You can use vegetable oil or sunflower oil in India. Reg. applesauce, it can be prepared at home itself. Just wash and peel the apples. Cut them into small chunks, add little water and cook it (on stove top or microwave oven); cool it and blend it; applesauce is ready. It is as easy as preparing mashed potatoes, if that’s what you mean by the alteration mentioned in the comments section. 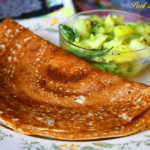 how to consume buttermilk, any other savory receipes? Thanks Nidhi. I’ll get back to your requests after my vacation. 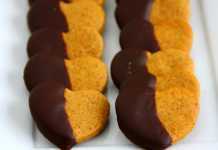 Just made the biscotti and the crinkle cookies. Thanks! 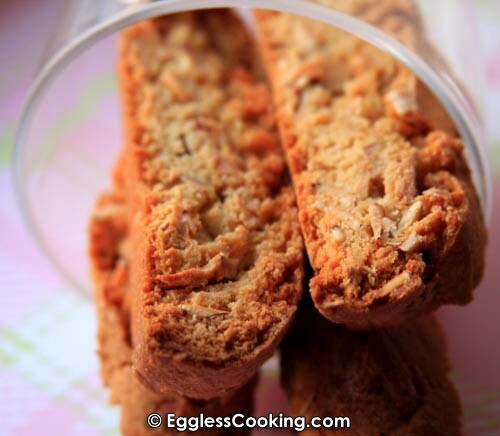 As for me, I made the biscotti with the reduced sugar and thought it could use more if eaten as a cookie. I like the anise idea too. 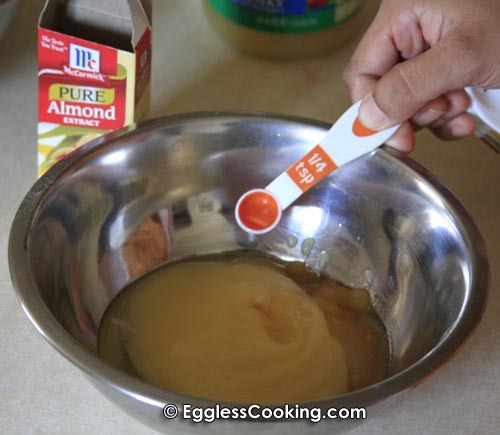 Used a little more than a tablespoon of amaretto instead of almond extract. You’re weclome Katherine. Amaretto sounds great too! Great recipe! I did not have applesauce so I used mashed sweet potato with a little extra water to make a similar consistency. 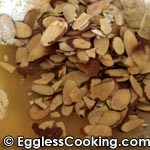 I left out the almonds and almond extract. Instead I used walnuts, 1/2 tsp cinnamon, 1/8 tsp cloves and 1/2 tsp mace. 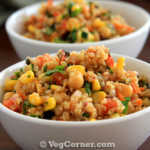 Thanks for the feedback Anne and I love the twist you have given to the recipe. Did you use whole wheat flour or all purpose flour? 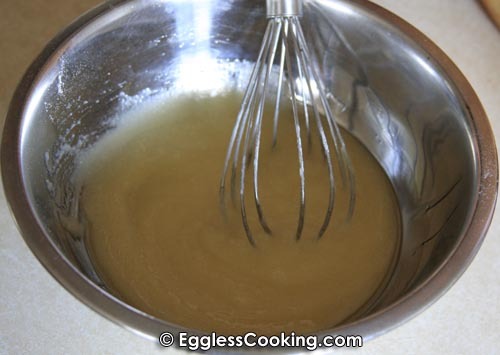 Reg applesauce, usually it is used as a substitute for fat(oil/butter) or eggs. In general half the quantity of fat is substituted by applesauce for low calorie baked goods. 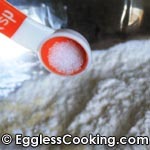 In this particular recipe I’m not sure if it is used as an egg substitute or fat substitute. 1. 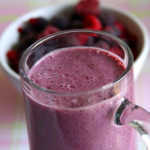 Reduce the quantity of sugar to 1/2 cup. 2. Instead of using 6 tablespoons of applesauce, I would replace it with 4 tablespoons of vegetable/canola oil and 2 tablespoons of honey. 3. 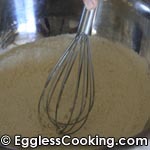 Also try using all purpose flour itself instead of a combination of whole wheat flour and all purpose flour. We did not like the flavor of whole wheat flour in the biscottis.